The Winter Garden was designed in the 1860’s by Scottish man, Charles McDonald, then head gardener at Woodstock. 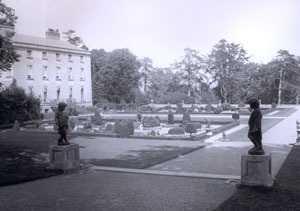 The garden is made up of four sunken panels that once contained elaborately planted parterres. These were sited with in a massive embanked terrace, held in place by ashlar granite stone walling. The creation of the great terrace was a massive undertaking and involved the removal of more than 200,000 cubic yards of soil from the area adjacent to the Monkey Puzzle walk thus forming the present rockery and ponds. The masonry was quarried, cut and ornamented by local men, as were the granite balls and finials that once surmounted the wall coping. On the east side a magnificent perron staircase, surmounted by balls and cast iron urns, led down to the Croquet Ground. 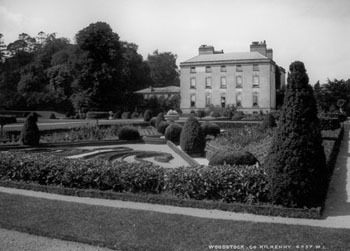 The positioning of the Winter Garden provided a foreground to the magnificent views to Mount Brandon and the River Nore Valley and complemented the late 18th Century ‘natural’ landscape. Each sunken panel of the Winter Garden was planted with evergreen trees and shrubs set out in regular patterns. The beds were surrounded by coloured gravel, which gave a certain amount of colour throughout the year. The highly contrived patterns of this ornamental area could be admired from the elevated position of the house. The sunken garden maximised the possibilities of the parterres, enabling visitors to look down as well as across. Access to the Winter Garden from Woodstock House was by means of a magnificent iron staircase, designed by the famous Dublin iron master Richard Turner. The Gardener’s Chronicle in 1863 described the staircase as being ‘ a masterpiece of elegance and durability’. The two panels nearest the house had an embroidered design in box with a red gravel background – in the style of what was sometimes known as a parterre des pièces coupés. The two panels furthest from the house were designed as a St. Andrew’s Cross, with one pair of the resultant triangles filled with scroll work in a Grecian honeysuckle design and the other pair filled with flowers. Plants used in the garden included Japanese laurel, Alexandrian laurel, butcher’s broom, cotton lavender, Laurustinus, box and yew. The Winter Garden is currently under restoration.